A fast, reversible, and energy efficient sorbent for the separation of carbon dioxide from mixed gas streams has been sought for energy applications in purifying flue gas and upgrading biogas. Biogas is a methane-rich gas evolved from decomposing organic matter at farms, landfills and wastewater treatment plants. While thousands of biogas generating facilities operate across the US, many are too small in scale to meaningfully utilize the biogas as an energy source, and flare the gas instead. Biogas is composed of roughly 60% methane and 40% carbon dioxide. If the carbon dioxide content could be safely and cheaply purified out at a small scale, these facilities could inject this excess methane into the natural gas pipelines, amplifying a largely untapped energy source. Physisorbent materials adsorb gases to their surfaces through weak physical interactions and offer a potentially safe, fast and reversible means of carbon dioxide separation. These materials, however, are limited in their efficacy by their surface area and adsorbate-adsorbent interaction strength, characterized by the isosteric heat of adsorption. The Fultz group at Caltech has recently demonstrated that under high pressures and nonideal conditions, the high surface area, superactivated carbon MSC-30 has an anomalously increasing isosteric heat of carbon dioxide adsorption. This favorable increase in isosteric heat (~10%) improves carbon dioxide capture and is attributed to an optimal pore structure in MSC-30 enhancing lateral adsorbate-adsorbate interactions through a cooperative effect. Notably, this effect is absent for methane adsorption on MSC-30, showing for the first time that these cooperative enhancements are highly specific not just to the adsorbent, but to the adsorbate-adsorbent system. This specificity is crucial to enhancing gas separation through uniquely tuned cooperative interactions. Their work has been published in AIChE Journal [M. Murialdo, C.C. Ahn, and B. Fultz, “A Thermodynamic Investigation of Adsorbate-Adsorbate Interactions of Carbon Dioxide on Nanostructured Carbon,” AIChE J. (2017). DOI: 10.1002/aic.15996]. 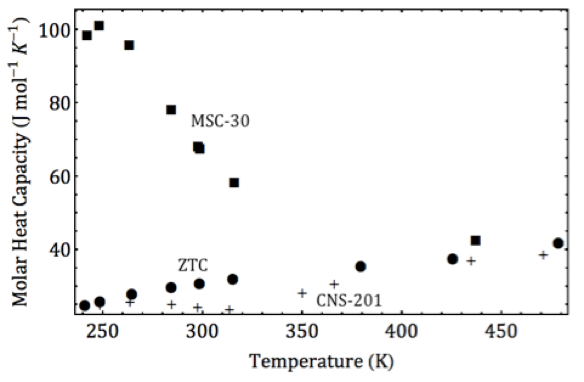 Caption: The isosteric heat of carbon dioxide adsorption on MSC-30 has a large peak at low temperatures owing to a cooperative clustering phase transition. This effect is not seen for carbon dioxide on other high surface area carbons ZTC or CNS-201.